Macedon, NY (February 8, 2019) -- Auburn Bearing & Manufacturing is excited to announce the addition of two miniature thrust ball bearing series, the F series and the FM series, to its trusted line of thrust bearing products. 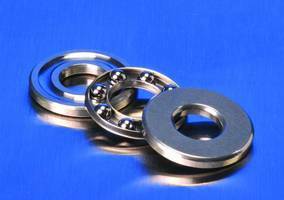 These two lines of miniature ball thrust bearings are made with high precision and can accommodate axial loads in a single direction only. The only difference between the two series’ lies in their raceway; the F series is designed with flat raceways, while the FM series is designed with grooved raceways which accommodate similar applications that require larger speed and load ratings. Auburn Bearing & Manufacturing, founded in 1989, is one of the oldest continuously operating thrust ball bearing manufacturers in the United States. ABM is known for its exclusive line of “V” groove thrust bearings, which are designed to reduce rolling friction. Today, ABM specializes in manufacturing custom ball and roller thrust bearings in low- to mid- volume, as well as in custom manufacturing. For more information on our company and what we have to offer, please give us a call at (315) 986-7600 or visit our website, www.auburnbearing.com, where you’ll find our complete digital catalog, specifications for our full range of ball and roller bearing products, and guides on bearing design, installation and maintenance.